The 23-year-old has been called out by Jose Mourinho for his fitness issues too often for the fans’ liking. 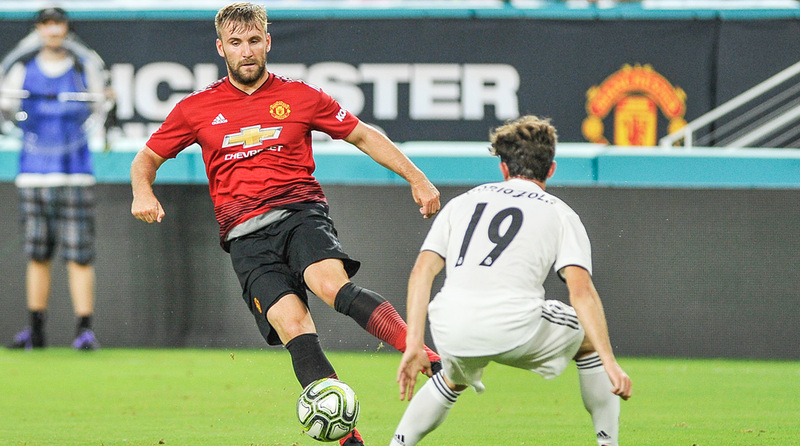 Luke Shaw, Manchester United’s forgotten man, has declared he’s ready to put his injury-wrecked years behind him and establish himself as a club regular this campaign ahead of Friday’s Premier League season-opener at Old Trafford. United take on Leicester City in the first game of the 2018/19 season and after a full pre-season, the 23-year-old left-back is full of hope. “It was a very tough but beneficial pre-season. We know what we are capable of so I think everyone is looking forward to just getting out there and enjoying the Premier League again” Shaw was quoted as saying by the club website. United, as manager Jose Mourinho pointed out on an umpteen number of occasions, were bereft of several first-team stars due to their involvement at the 2018 FIFA World Cup with their respective nations. And the club have largely failed to land most of their transfer targets, leading many pundits to call off United’s season before it’s even begun. Thursday is the last day of the summer transfer window in the English top-flight, so United could still make a few signings in theory. England were among the surprise packages at the World Cup, while Marouane Fellaini and Romelu Lukaku’s Belgium achieved their best-ever finish at the quadrennial tournament by clinching third place. And of course, star midfielder Paul Pogba was among the standout performers as France lifted the title, but despite the speculation surrounding the Frenchman, Shaw asserted that the players that have returned will be spurred to perform even better this coming season. Despite some of them training for less than a week, the English and Belgian players are expected to play some part on Friday. Romelu Lukaku, Marcus Rashford and Phil Jones were among the players who cut short their holidays to reinforce Mourinho’s injury-hit squad. “I feel really good and I’m really ready to go for the starting game on Friday and I’m ready for the season,” Shaw asserted, in what was the key takeaway from his interview. With Ashley Young only just having returned to first-team training, Shaw is expected to start against the Foxes. Shaw, who signed for United in 2014 after the club paid £30 million for his services to Southampton, hasn’t turned into the world beater fans expected him to be. Injuries, and a lack of fitness have played their part and while he’s still young, most of the United faithful are sceptical regarding his consistency. In the four seasons he’s been at Old Trafford, the left-back has made just 66 appearances. He’s significantly cut down on his fat percentage this season, however, and has reportedly trained excellently. Performances in pre-season have been encouraging, but the jury is still out. What goes without saying is that the Englishman needs to make a perfect start to the season when United host Leicester on Friday night.